Defense Minister Frank Bakke-Jensen told Parliament on Tuesday that attempts to raise the sunken frigate KNM Helge Ingstad will start Thursday and already have cost around a half-billion kroner. Within a half-hour of his speech came word of more salvage delays, while debate is swirling over government plans to dip into the country’s Oil Fund to pay for it all along with some other major projects. It didn’t take long for other officials at both the defense ministry and the defense material division in charge of the salvage to raise doubts about any raising of the frigate, which collided with a fully laden oil tanker nearly three months ago. They told both newspaper Bergens Tidende and state broadcaster NRK that the salvage operation could likely be delayed again. It also remains highly uncertain how much the operation is costing, and how the government will finance replacement of the sunken frigate that cost Norwegian taxpayers around NOK 5 billion. The collision, which continues to raise questions of negligence on the part of the frigate’s crew on its bridge, was described as “tragic” by Member of Parliament Martin Kolberg of the opposition Labour Party. 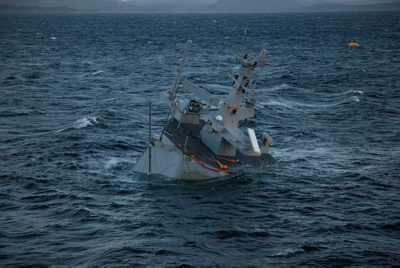 Bakke-Jensen said the salvage bill “so far” has hit “around a half-billion kroner (NOK 500 million, or USD 60 million). Kolberg called for an investigation into the salvage operation itself, while also referring to many questions around the reasons for the sinking. Both he and MP Audun Lysbakken, leader of the Socialist Left Party, demanded “full openness” around the accident, which so far has been attributed to “a string of events” by the state accident investigation board. Few are satisfied with that explanation and Lybakken claimed “maximum openness” was needed in order to maintain public confidence. Debate and criticism of the government is also flying over Prime Minister Erna Solberg’s proposal to meet expenses of the accident and raise the billions needed to replace the frigate without making reallocations from the state budget. That would mean dipping into Norway’s huge sovereign wealth fund known as the Oil Fund, where revenues from the country’s offshore oil production are supposed to be saved for future generations. 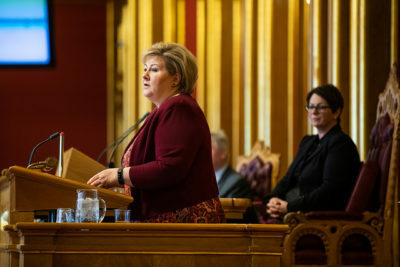 Solberg has raised a ruckus recently over her new expanded majority government’s platform that now proposes pulling an extra NOK 20 billion out of the Oil Fund. The money would be used to not only replace the frigate (at a cost of at least NOK 4 billion) but also to pay for construction of Norway’s new government headquarters, which was destroyed by an ultra right-wing Norwegian extremist’s bombing in 2011. That project is expected to cost around NOK 15 billion. Solberg claims both projects can be blamed on “an extraordinary and unique situation that Norway has never experience before.” Since the state basically insures itself, she thinks she can justify using Oil Fund money to cover the claims. “What we’ve been subjected to here are a massive terrorist attack in which four large, state buildings were destroyed, and we have had a ship that sunk,” Solberg told news bureau NTB this week. She thinks it will be “too demanding” to allocate funding for the projects from the regular annual state budget, which is only allowed under Norway’s so-called handlingsregel (rule for Oil Fund use) to spend estimated annual earnings from the Oil Fund and not dip into the fund itself. Those estimated earnings are currently set at 3 percent of the total value of the fund itself. The “discussion” began immediately, with economics professor Hilde Bjørnland at the Norwegian Business School BI claiming that Solberg was “sending the wrong signal” about oil fund use, while former central bank chief Svein Gjedrem told newspaper VG that Solberg’s proposal was “clearly in violation of state budget rules.” Newspaper Dagens Næringsliv (DN) editorialized on Tuesday that Solberg’s proposal amounted to “pure budget tricks” that were “unprofessional” of the prime minister. She was, moreover, accused of lacking the ability to set priorities. Solberg conceded that many economists “think we can only follow the Oil Fund rule further, but I think none of them have considered the problems the self-insurance principle can raise, especially when it comes to handling huge claims (like the loss of a frigate or a government headquarters).” She noted that the state also needs to expand and build several new hospitals over the next several years, and that will also put heavy demands on the state budget. Others claim Solberg’s proposal would set a “dangerous precedence” by all but robbing pension guarantees for future generations. “It difficult to see any other motive here than that the government wants more room to act in a difficult budget situation, where four parties (in the government coalition) all want to put their marks on the budget,” Guttom Schjelderup, professor of economics at the Norwegian business school NHH in Bergen, told NRK. Ragnar Torvik, a professor of economics at NTNU in Trondheim, told NRK that “in practice,” Solberg’s proposal means the government “wants to increase use of oil revenues but is trying to present it as something other than oil revenue use.” Her logic, Torvik said, is weak on several points, not least considering all the money the state saves every year by not purchasing insurance to cover big claims like destruction of the government headquarters or the loss of a frigate. Theoretically, that money should be available somewhere for use now without having to dip into the Oil Fund.